Masquerade's monthy Program & Social Evenings are on the 2nd Friday of each month! Every Meeting! - Girlstuff Fun! Makeup tips, dressing tips, making new friends! Although our parties and visits to the "TG Friendly" clubs in Winnipeg can happen at any time of the month, we hold regular monthly Program & Social Evenings, on the second Tuesday of every month, which gives us something to look forward to on a regular basis - GIRL TIME!! Plus, it is really nice to have a special place to go where we are all accepted as ourselves. Many members have described how nervous they were coming to their very first Social Evening, and how they now look forward to every gathering and club event as it gives them a feeling of freedom outside their home. Meeting new friends and knowing you are not alone are the key reasons we exist as a group. Attendance varies as many of our members have other commitments etc.. But we usually average between 12 and 20 girls out. 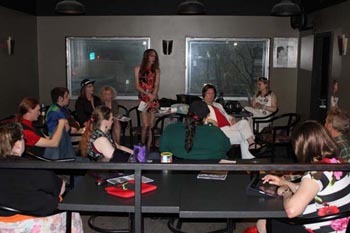 Once the business part is done, you know, all the boring but necessary mumbo-jumbo that keeps the club going, we usually have a presentation, guest speaker, video, or sometimes we just do "girl-talk"! If you are the wife or girlfriend of a crossdresser, Masquerade is a place for you too. It is so special for couples to get out and have fun together as "Girl-friends" for an evening out. Our guest speakers have ranged from makeup experts, wig experts, dress makers, jewelry makers, to counselors and police officers. All of them have been very interesting and understanding. Our own presentations have included CD/TS related videos, makeovers, shopping tips on everything from clothes, makeup, shoes, wigs and anything else a girl needs! for lots of pictures taken at our meetings and other events. Program & Social Evening - 7:30 PM!! Please feel free to email us at girlstuff@masquerade.ca or call our membership chairperson Mary at (204) 275-3871 if you are interested in attending either as a guest speaker or potential member.